Using the right bag for the job makes everyone’s life easier. Made from a full 4 mil thickness of superior low-density plastic, these 55 - 66 gallon black contractor bags are ready to take on the kind of intense trash that only a construction site can produce. Fill them up with drywall, nails, wood, broken concrete, shattered glass: you name it. The serious puncture-resistance and exceptional resilience of these 4 Mil black contractor bags makes them indispensable on any project. You can use them free-standing, but the strong expanding gusset seal means that they can provide an excellent fit for large drum cans as well.Contractor trash bags make the toughest jobs easier. Made from a superior plastic with 4 mil in thickness, our 55-60 gallon workhorses are built to take on the kind of intense trash that only a construction site can produce. Fill them with drywall, nails, wood, broken concrete, shattered glass – these contractor bags can handle it all. 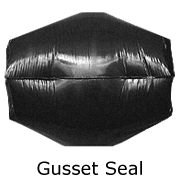 The resilience and serious puncture-resistance of these 4 mil bags make them indispensable on any project. An expanding gusset seal provides an excellent fit for large drum cans, but these contractor bags work in freestanding applications as well. Gusset Sealed Trash Bags are sealed on the bottom and the sides are tucked in to form gussets, or extensions. The gussets give the bags a clean, square profile making these bags a great fit for many types of trash cans or as a free-standing bag. While they can generally handle heavy loads, they do have a tendency to leak with very wet trash.